So, here’s another one filed in the “hope this saves someone some grief” category. I was cruising along with my home automation ‘droid app, setting my layouts and wiring up my button click handlers, when all of a sudden, I was getting weird build errors about. I couldn’t run or even build. 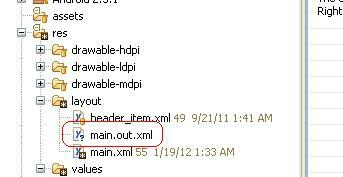 When I tried to build, I got messages about different things being redefined in my main XML layout file. This was strange, since I hadn’t edited it directly, but was using the graphical layout tool. After some googling around and experimentation, I discovered that this file is generated if you run with the Play icon and the XML file open as your selected window in the editor. Perhaps that’s something that Eclipse users are used to, but coming from a pretty solid couple of years of Visual Studio, this had me mystified. So, lesson learned. Don’t run if you have XML open in Eclipse (or anything else you don’t want slapped with a .out between filename and extension and apparently included in compilation.